A digital start-up with pink cords and tweed? Recent research by XpertHR suggests that more than 90% of employers have some form of dress code. According to this study, the vast majority (82%) of employers do so in the “hope that setting standards for dress and appearance will boost or safeguard the organisation’s external image.” Which raises the interesting question, should a dress code be part of your employer brand? Uniforms, or work clothes branded with the employers’ logo, are common in many public-facing areas of retail and the public sector. Some people like this, preferring not to have to think every morning about what they are going to wear. Others (think our very own digital industries) prefer to be able to dress very informally, but even in those environments conformity rules. If you are a techie and don’t believe me, try wearing a tweed jacket and salmon pink cords to the office. Spookily, while researching this, an advert, reproduced below, appeared in the middle of an article. 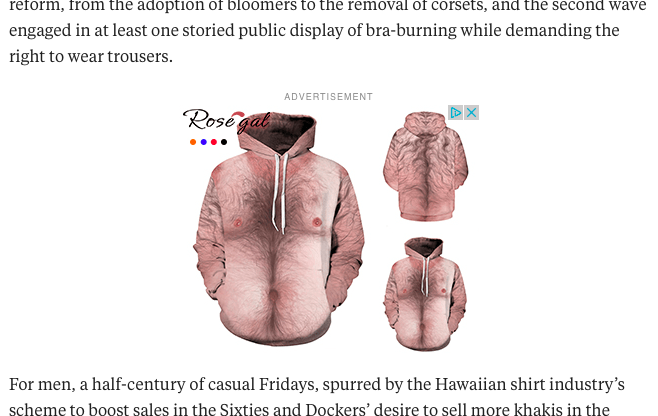 For some the idea of a hirsute male torso on a hoodie may be amusing, but I suspect that the majority of us would not wish to see one of their colleagues wearing this at work. Attitudes largely depend where on the age spectrum you sit, but, in general, I think most people would agree that client-facing staff and managers are expected to be “smart.” By and large, we have reasonable latitude in how we dress and style our hair, including facial hair, but the aforementioned excessive body piercings, face tattoos, and a huge range of wearable items may well spark debate. High-heels provoke many different opinions too, especially since the incident two years ago when a receptionist was sent homefrom PwC for refusing to wear heels and her case was debated in parliament. Obviously, employers need to be aware or the law. While ripped jeans are frequently banned, it’s unlikely that anyone would try to challenge such a ban in court. However, given that so many of social mores cross the Atlantic, we should be aware that the traditional distinctions between the sexes’ clothing are increasingly being eroded, so much so that in New York City gender-specific dress codes are prohibited. Will that happen here? I wouldn’t be surprised. We also have “protected characteristics,” which allow specific religious items to be worn. No-one would tell a Sikh that he couldn’t wear his turban, but what about a Scotsman who insisted on wearing a kilt in the traditional manner? And while (unless there is a very good reason not to) Sikhs are permitted to carry a Kirpan (a ceremonial, religious dagger), a kilted Scotsman is certainly not allowed to attend work with a skean dhu dagger in his sock. Interestingly, the XpertHR study shows that, for the most part, we’re not too fussed by dress codes. Only 13% of their respondents complained to their employers and these complaints were usually about practical things rather than fashion – such as being refused permission to wear shorts in hot weather (I suspect these are not from people in Scotland) or not being allowed to wear flip-flops or sandals. Basically, it’s common sense, because we are almost all very conservative in our dress. So if you want to change job, speak to your recruitment agency about your potential employer’s policy before an interview. And if you really don’t like wearing a tie, or want to wear heels, and the employer takes the opposite view then you’re going to have to either pull out or change your sartorial habits. In most workplaces, no-one is forced to wear anything and you can dress as you wish within the accepted, albeit constantly shifting, parameters of society. I rather think this is how it should be. * in the opinion of many - Yes!